The UK is really doing well for magazine freebies at the moment, and this is another one not to be missed. 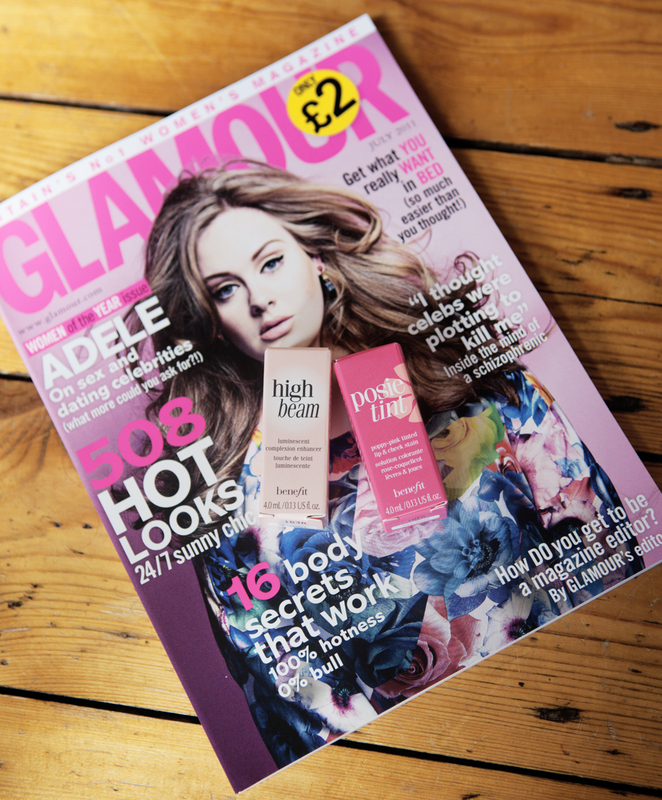 Free with the July issue of Glamour magazine (with Adele on the cover, looking rather gorgeous), is the choice of three Benefit items - High Beam, Posie Tint or BeneTint. I knew the products wouldn't be full sized, but once they were out of their packaging they looked tiny - like they'd been designed for The Borrowers. 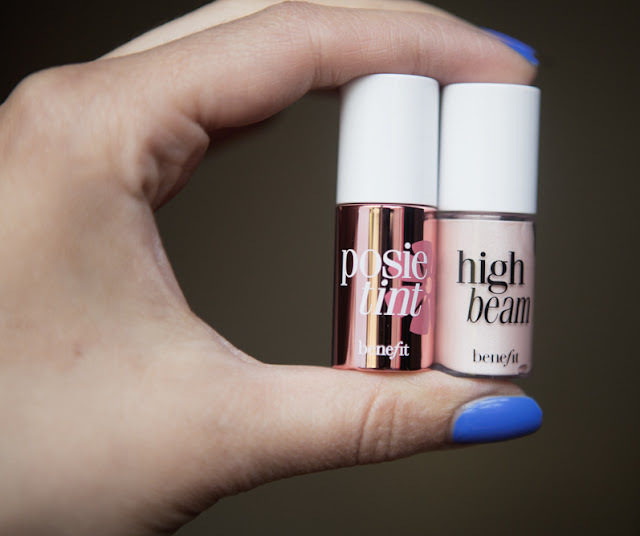 They are 4mls each - as full sized products Posie Tint & BeneTint are £24.50 for 12.5mls, and High Beam £18.50, so you're getting about £10 worth of product, despite how small they seem. As you may have guessed, I decided to go for Posie Tint, which is a pink coloured cheek and lip stain, and High Beam which is a highlighter. Both come with a brush applicator, a little like nail varnish, and they are easy to apply. The photos above are of Posie Tint. 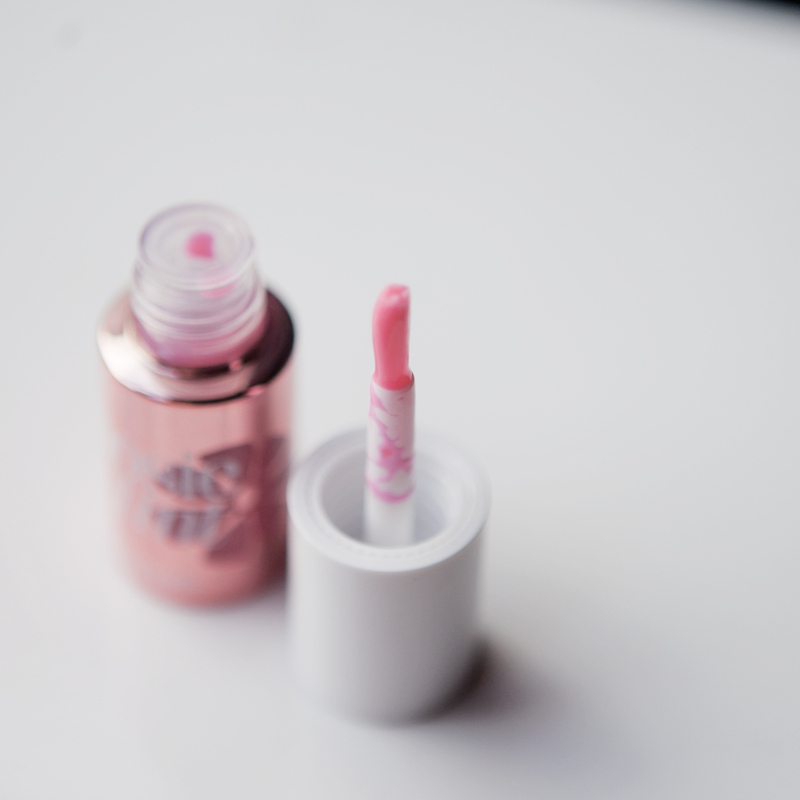 It looks quite a shocking candy coloured pink on the brush but once it blends in to your skin it is a pretty, babydoll pink colour. The swatch on the left is it dobbed onto my hand, and the right is it blended in. As I write this blog post, about 3 hours later, the tint is still well and truly on my hand, and looks a little like felt tip pen! I used it on my lips in the photo above, it is still quite a natural look, but makes the lips more interesting than being completely bare. I think it is a universally flattering shade, a nice soft look. I imagine as a cheek stain it is also very pretty, but as I already had blusher on for the day I didn't swatch it on my cheeks. 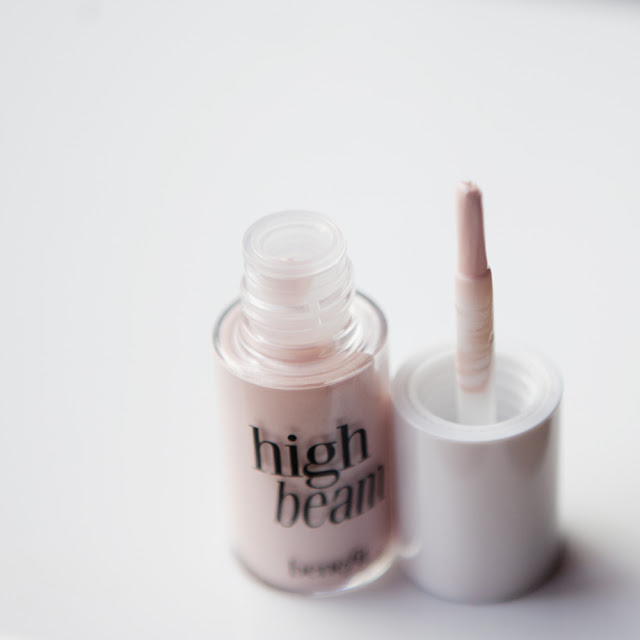 High Beam is described on the Benefit site as a satiny pink liquid highlighter accents cheekbones and brow bones for a radiant glow. It's known as the "supermodel in a bottle". As well as being able to use it as a highlighter, you can use it all over your face for a glowing complexion, but I would recommend using a small amount of product to do this as it does highlight rather a lot! 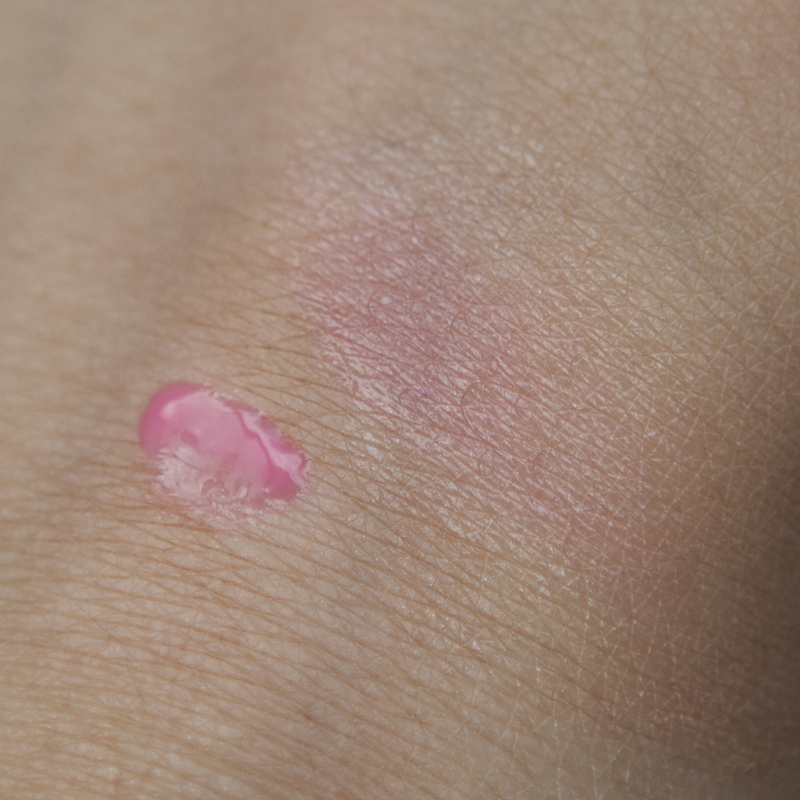 The swatch on the left above is it brushed onto my hand, and on the right blended in. 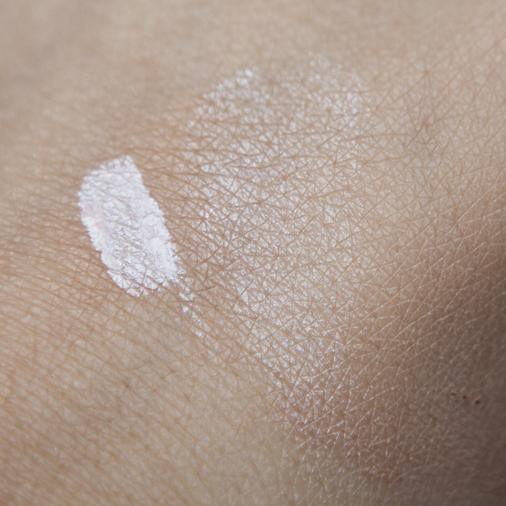 Here I applied a small amount to my brow bone, it gives a nice subtle shimmer. 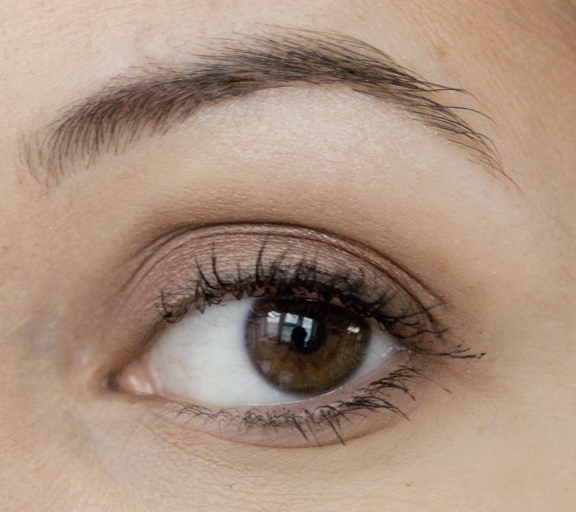 You can be more heavy handed for more of a glow, but be careful not to get any on your actual eyebrow as the colour does show up, as I discovered! I am looking forward to having more of a play with both of these. Although they are small, I think it's a good, inexpensive way of trying out a product, and perfect for having in your handbag on a night out. Glamour seemed to be flying off the shelves in the two shops I went in, so get in there quick if you want to take advantage! I'm so glad these have come as samples. I've always wanted to try out High beam but for the price I would be disappointed if I didn't like it. Thanks for the heads up! I cannot wait to get my hands on these little babies.